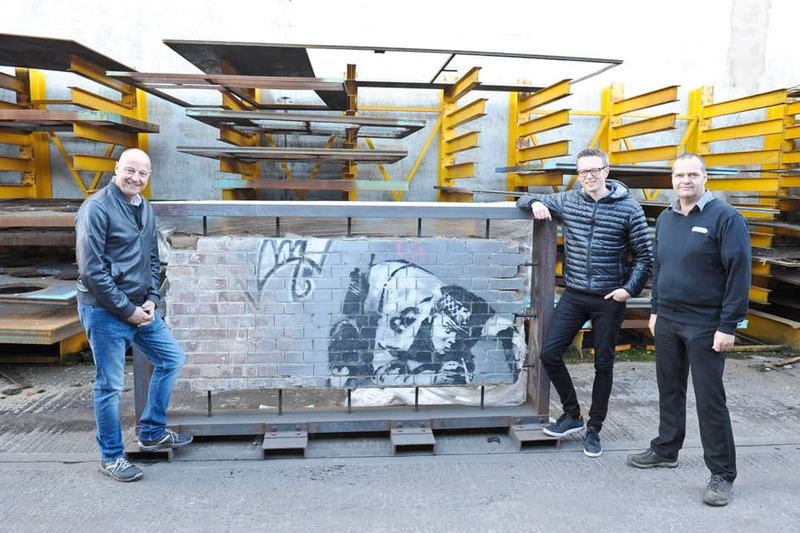 The iconic ‘Snorting Copper’ by Banksy has been successfully restored and returned to it’s rightful home in Shoreditch, London. The artwork, which first appeared on a public toilet block in 2001, had been subject to considerable damage. Property developers bought the site and proceeded with restoring Banksy’s embattled work by contacting the Fine Art Restoration Company. The Snorting Copper was painstakingly extracted from the wall, and boarded up to keep intact for the long 300-mile journey to Carlisle. Specialist restorers then began their meticulous and diligent restoration process to conserve the artwork. It had been vandalised by would-be thieves who attempted to prise the face of the Copper from the bricks with an angle grinder. Further injury came from Hackney Council when the artwork was painted over, and part of it was also jet-washed away and painted over again with whitewash. After various attempts to destroy and steal the artwork, it was a relief to Banksy’s innumerable global supporters that the Snorting Copper was taken off duty to be restored. Banksy remains a source of intrigue and mystery around the world. Working anonymously and in the dead of night, graffiti-artist Banksy is a global phenomenon whose satirical work is often deeply political. The ‘Snorting Copper’ depicts a uniformed policeman on hands and knees taking drugs. The piece is not the first of Banksy’s work to feature the police, after ‘Kissing Coppers’. Other popular installations include the Brexit mural and ‘Girl with Balloon’ which came top in a poll on the nation’s best-loved work of art. Very little is known about Banksy’s life and identity, but his artwork has appealed to millions. Consequently, the completed artwork has since been valued at £1.25m. Once the Snorting Copper was completed and transported back to Curtain Road in Shoreditch, it was unveiled to huge national and international interest. The Guardian, BBC, ITV, Evening Standard, and The New York Times have all reported on the story. The Fine Art Restoration Company has also been heavily featured in a major BBC documentary. You can also watch a video on the entire restoration process, featuring the Fine Art Restoration Company, detailing the Snorting Copper’s journey to being back on the beat.